Once you have learned how to write a job description and created yours, you can post it for free on our recommended job board, Indeed. You can also advertise jobs you post. Indeed makes it easy with a $50 free credit toward advertising your job postings to move them to the top of the job seeker’s search results. Our job description template serves as a fill-in-the-blank document that you can give to hiring managers to help specify the job duties and requirements. You can download the template as a DOC or PDF file and customize it by adding your own company logo and company-specific details. Download our Job Description Template as a DOC or PDF. Think about what the day-to-day responsibilities of an employee in the job are and then note those responsibilities in a list. Consider what the main goals are that the job holder is responsible for. What are the basic functions? What might their day-to-day life look like on the job? Are there daily tasks? Weekly tasks? Monthly reports? Are there team meetings where they will need to present? Notice how specific they are? Try to create a list like this for each job you’re creating a job description for. One of the mistakes that small business owners often make when writing a job description is not outlining in detail what the day-to-day responsibilities of the employee will look like. This makes it hard to identify the right candidate for the job and makes it less likely that your job posting will attract people with the specific talents you require. Moreover, it attracts the wrong candidates to apply to your posting as well as confuses individuals in the job. That’s why the first step is to map out the job in detail. Once you list the responsibilities of the position, you’ll need to think about the skills and experience that a candidate needs to succeed in that role. To make this list the most effective for your job description, order it from most important to least important. An easy way to do this is to separate the skills and experience that an employee has to have to even be considered for the position, from those that would be nice to have, but are not absolutely necessary, to those that are required. Candidate must have a GED/ high school diploma. Candidate must have three or more years of experience in QuickBooks, including using it daily for work in most recent role. Candidate needs to be familiar with working in a small business and/or working directly for the CEO. Must be punctual, efficient, accurate, and willing to take criticism. An Associate’s degree or Bachelor’s degree in accounting or related field is preferred. A+ candidates will also be collaborative, team players, and be willing to get the job done, even if that means extra hours. Notice that some of these are must-haves, and others are preferred. This provides you flexibility in hiring but also puts job seekers on notice that other candidates may be more qualified. Traits, like maintaining composure under pressure or having a sunny disposition, are often important when you’re hiring for a position or want to remind existing employees of what’s required. Many like to draft their thoughts on the personality traits the ideal candidate will have and clarify the working environment so that there are no surprises. For example, if the work environment is high pressure, not temperature controlled, or subject to constant interruptions, candidates and employees will need to be told that, so include it in the job description. Personality and cultural fit are critical in the hiring process. 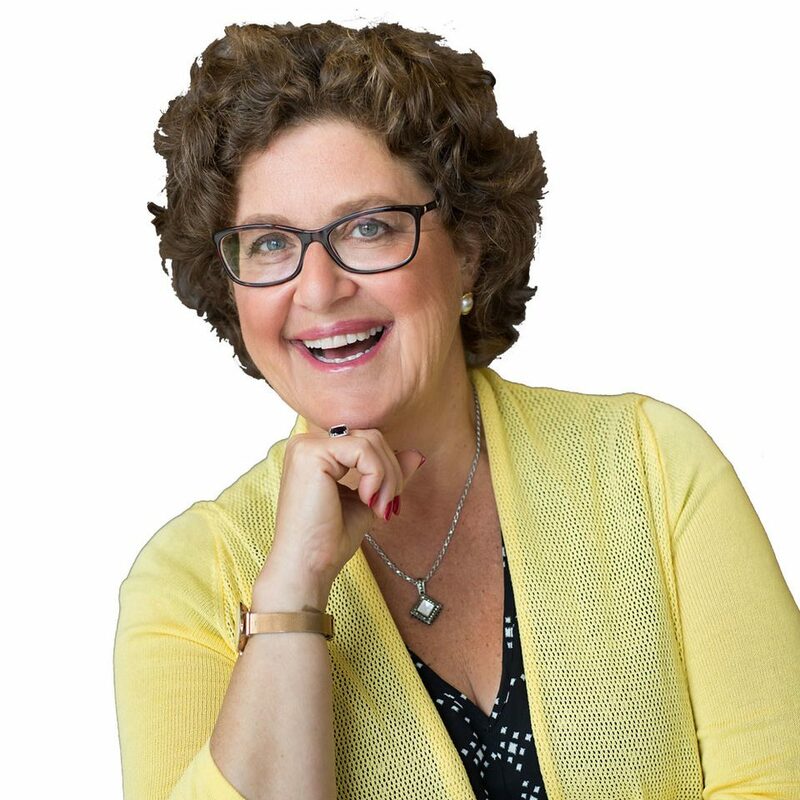 Southwest Airlines is a famous example of a company that practices this and truly looks for a personality that aligns with the company’s culture and values. Before you draft your job description, ask yourself: what kind of personality are you looking for in this role? Do you seek a heads-down introvert who can roll with the punches or a bubbly extrovert who speaks up? Adding in some desired personality traits to your job description can help enlighten your applicants to what you are looking for on a deeper level, saving everyone time and bringing you the right applicants! Does the person in this role work independently or as part of a team? How much flexibility do they have in how the job is done? Do you need someone who can simply follow instructions or someone who can operate with little supervision? How does doing this job in your company differ from doing a similar job at other companies? What kind of people (with what kind of temperament/personality) work best under the current manager for this role? Combined with personality traits, the work environment is a great section to include in your job description to shed even more light into which applicants would be a great fit. Creating a profile of the ideal candidate can also be helpful. You may want to add a section in your notes for what the ideal candidate looks like in terms of skills and experiences in more detailed terms. This is often based on existing employees who have done great in the role. 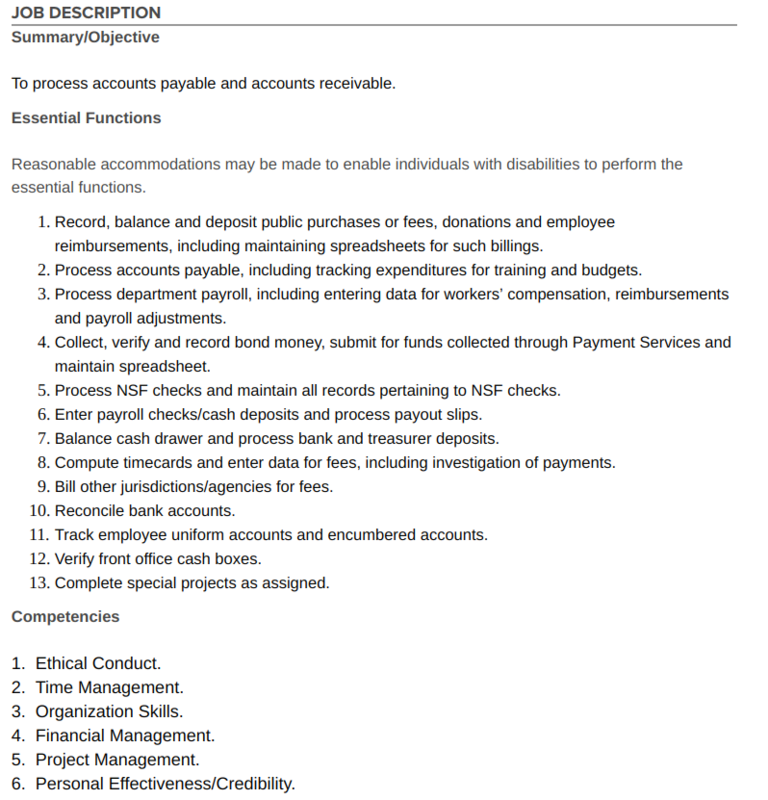 For example, you might add: The ideal accounts payable clerk will be advanced in their knowledge of QuickBooks with an ability to create meaningful management reports and have an Associate’s degree or above in accounting. They should also be able to work under pressure in fast-paced situations with tight deadlines while maintaining a friendly disposition and good internal customer service. Most businesses use job descriptions for one of two reasons. The first is to clarify job roles for existing employees so that both you and your staff are on the same page regarding what the job requires. The second is to clarify the minimum requirements, skills and experience needed so that qualified job seekers are encouraged to apply for your open positions. Each use requires different information to be included in the job description. Here are the two types. An internal job description is used to clarify an employee’s job role. It’s used during new hire orientation as you begin onboarding the new hire, as well as used for existing employees during performance reviews. It’s also helpful as a tool for managers to coach their employees on job expectations, and can be used by internal job candidates seeking a promotion. The table below shows the sections that may be included/excluded based on whether you’re using the job description for internal use only. Sample Job Description that SHRM members can download. The real power of a job description is that it can be enhanced and published on a job board to attract job seekers to apply for open positions at your company. In that case, you’ll want to add additional sections to your job description that may entice job seekers to apply, such as your company history, culture and work environment. Here is an example of a job description posted to Indeed. Notice how it includes information to entice a job seeker to apply. 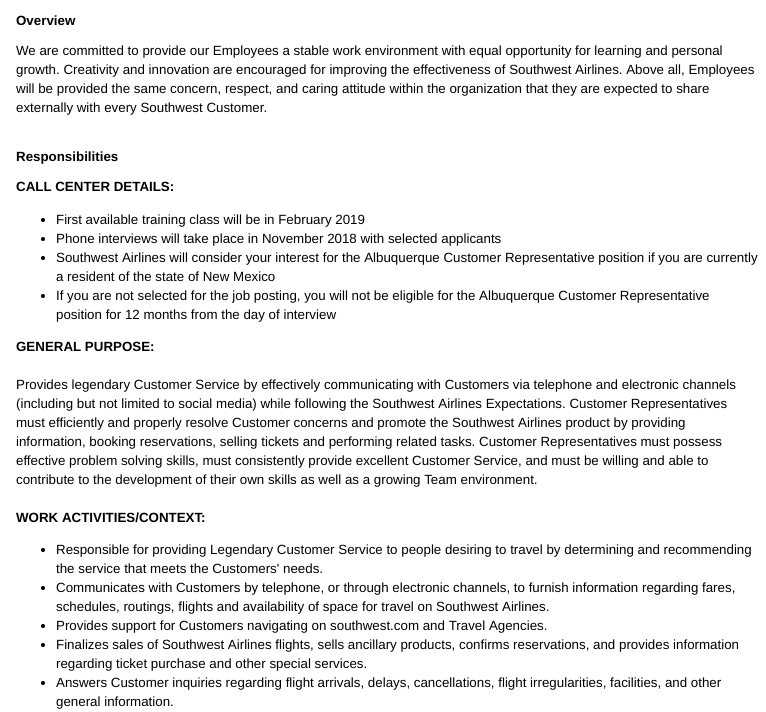 Sample job description from Southwest Airlines posted on Indeed. The table below shows which sections are most important for each use of a job description—internal versus job posting. However, any and all of these sections could be included based on your specific needs. Job postings are a marketing piece to get the right candidate to apply. Don’t just post your job description, any more than you would put a list of products out to customers. Start your ad with compelling reasons people would want to apply at your organization. Then talk about the reasons someone would want to work for your business, and what they can expect to learn and be responsible for in the role. Show six to eight of the essential functions, and then give them details on the qualifications. Using this formula, you will attract the right candidate…and ensure the wrong candidate doesn’t apply! A job description template, like ours, makes it easy for you to include the most important sections within your job descriptions and ensures that you don’t forget anything. It also allows your job descriptions to remain uniform across all jobs (making it easier for your hiring team to use them for staffing, training and referrals). You’ll find the following sections within our template. You can rename, add or delete these sections to customize them to your business. If you currently use the free timekeeping and scheduling software Homebase, you’ll find they’ve added free sample job descriptions for common hourly jobs. They can also help you find hourly workers using their new job posting function. Another alternative is to join a membership organization like the Society for Human Resource Management (SHRM), as they have hundreds of pre-made job descriptions. Once you pay for a membership that starts at about $195 per year for an individual, you’ll have access to these, and many more, HR tools and resources for a year. A creative way to come up with words and phrases that might attract candidates to your job description is to take a look at what job seekers list on their resumes for similar jobs. You can use Indeed’s free resume search feature for that. For example, if project manager resumes typically list PMP certification, then you might want to add PMP certification to your project manager job posting. This section should be three to five sentences, maximum. In general, postings with the salary range included tend to get more traffic than those with nothing listed. Simply put, you need to be playing in the same compensation ballpark as your applicants and your competitors seeking the same positions, and posting a salary will let you do that. The first thing you want to think about here is how much experience you need the person to have. Are you willing to pay extra to get someone who can come in and hit the ground running? That may require you to increase the salary above the average for the role. Or, would you rather pay a lower salary and train someone with less experience, such as a newly-minted college graduate? Once you have thought about this, go online and check salary data that’s available to the public, such as on job and company review sites like Glassdoor and Indeed. They can help you get an idea of how much your perfect candidate may require in compensation because they’ll show you the range of salaries paid to individuals in jobs with similar titles. Indeed not only provides salary data for free, but it offers unlimited free job postings for businesses to find top talent. Further, if you want to increase the reach of your job posting, you can sponsor a job by paying a per click fee. To help you get started, Indeed provides you with a $50 job posting credit, just for signing up. Once you settle on what the job should pay, you can use this cost of living calculator to adjust the salary levels you find for similar positions to your location. Ensure the salary you are offering is fair to both the potential hire and existing employees so that you don’t create pay equity issues. If there are competitors that you know have similar positions, you may be able to see what they are paying using Glassdoor.com or PayScale.com. You can also post queries to groups on LinkedIn—just be sure that you are comfortable with whatever you are posting being visible to the public. From this, you should be able to come up with a salary range. A sound range would reflect a 25 percent to 30 percent difference between the lowest and highest points, such as $60,000 to $80,000. However, if you do not intend to pay anyone—regardless of skill set—the top number, then adjust in order to prevent miscommunications and applicant disappointment. Also, remember to include any bonuses, such as employer-paid health insurance premiums, matching retirement benefits, commission plans, PTO, and other value-added perks to this section, since they are part of compensation. Let job seekers know how you would like them to apply; having a dedicated email address for applications is usually the easiest route, like recruiting@abccompany.com. You may want to ask applicants for a cover letter or for an employment application form, which addresses specific points or asks a specific question, the answer to which will help you weed out the good candidates from the bad candidates. In fact, Indeed, along with other recruiting software like Freshteam, often lets you set up screening questions for candidates to answer as part of their application process. This will make filtering through the stack of resumes easier, as you can immediately set aside those who do not meet specific criteria, such as years of service or experience with a specific software program. If you would like to keep track of your job postings and applicants, we recommend Freshteam, part of the Freshworks family of business applications. Freshteam is a free applicant tracking system that can post your open jobs to job boards, and then track applicants throughout the recruiting process. You can attach and email job descriptions to each employee, or have the employee’s manager provide them with a copy. We also recommend that you store the job descriptions in a searchable location, such as on your network or in G Suite. Regardless, publishing your job descriptions makes others aware of and able to use them to support job-related activities. It’s a best practice to maintain job descriptions online so that employees and managers can access them. This is helpful if the employee has a question about their job, or the manager is considering adding a new team member. In fact, a best practice is to attach or link the job description to the employee’s record, so there’s never any question about which employees do which jobs. Many payroll software providers, like Gusto, give you the option to store employee-related documents online. Gusto allows you to store employee files, like job descriptions, online. In fact, our top recommended small business payroll software, Gusto, provides this feature. With Gusto, you can provide the job description to the employee as part of onboarding and have the employee e-sign that they’ve reviewed it. All that is in addition to Gusto’s affordable payroll software that provides HR and employee benefits at half the cost of competitors like ADP. Once you have your job descriptions stored, you can publish them to a job board when you need to hire a new employee. For example, if you have your own careers page on your website, you can promote open jobs by linking them to the relevant job description. However, the real power is in using a job board that allows you to screen candidates based on requirements listed within the job description, such as years of experience or skills like marketing. 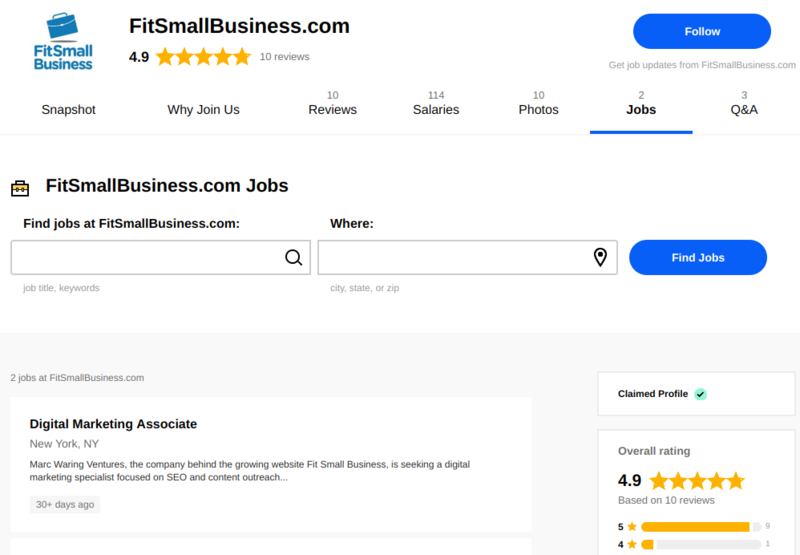 At Fit Small Business we use Indeed to post our open jobs. We recommend Indeed as our number one job board for small business because you can post your jobs, attach job descriptions and then create candidate screening questions to ensure that only those who meet your criteria in terms of education and experience are shown as qualified. Indeed will also track applicants and communicate with them throughout the entire recruiting process, saving you from having to purchase additional applicant tracking software. After the steps above are completed and you have your job descriptions, you’ll want to review and update them annually based on labor law changes or adjustments to the job duties. If fact, some lawsuits occur because an employer changes the job requirements of an employee without ever updating the job description. When the job description is shown as evidence, it’s outdated, and that may result in the employer losing the lawsuit. Savvy employers have additional questions about the risks and benefits of job descriptions. Here are some of the most common. What are the legal risks of having no job description? Job descriptions are one of the first documents that will be requested in an employment lawsuit. Failure to document details means a judge will likely favor an employee’s understanding of a job, since you, the employer, did not put the job details in writing. What are the most common mistakes employers make regarding job descriptions? Some businesses fail to include relevant details, such as physical requirements (like the ability to stand, lift, or speak English) and may find themselves party to an unfair hiring practices lawsuit when they don’t hire individuals because of these factors. Others make the mistake of using industry jargon in the job description. That can confuse new hires as well as applicants. Still, others fail to include a job duties statement such as “other duties as assigned by the manager,” and some forget to include a statement of expectation that employees are required to abide by the company handbook. These mistakes and omissions create risk for the employer, by causing employees to misinterpret the job expectations. Can a good job description prevent a lawsuit? The Bureau of Labor Relations (BLR) says yes. And that’s because a well-written job description can justify your hiring decisions and clarify job duties, reducing confusion and frustration that often lead to employee lawsuits. They also ensure that you adhere to labor laws by including relevant information like employment status (e.g., exempt/non-exempt). A great job description serves multiple purposes. It clarifies the job role for existing employees, reducing confusion and potential lawsuits while improving alignment and productivity. Equally as important, a good job description can be modified into a job ad, and it can help you hire even passive candidates. Those are folks who might not be looking for a job but may be enticed to apply to your company when referred by an existing team member. They may find your job description compelling enough that they go for it. Once you have learned how to write a job description and written it a job description, you are ready to recruit applicants. We recommend you check out Indeed, one of the largest job boards, for finding your new employees fast. It’s free to post jobs on Indeed. But, you can pay to advertise them too, if, for example, you want to increase the number of qualified job seekers who apply. Click here for a free $50 credit. After you have applicants in your recruiting pipeline, we recommend using Freshteam to track your candidates from resume review to interview to hire. Freshteam provides resume parsing so that you can compare top candidates side by side, and manage all the interview feedback in one place, leading to a legally compliant hiring process that provides you the best candidates, fast. Thank you for this informative post. It was helpful. I would like tyo ask you something about the business cards, Would you help me please? The thing is; Is there any job title in English that named “Stakeholder Management Director”? I mean is this usage is correct and if so, can we use this title for a civil society worker? I tried to find such a title and I found just one example but it was not for a Civil Society Organization. You might want to take a look at our salary tools article below to get a sense of what other titles are used for similar jobs. That way you can see what those jobs do (job descriptions) and what they pay (salary data). Thank you for this brilliant and comprehensive post, Christy. Clarity when it comes to writing your job description is always one of the important things in order to communicate well to job seekers and find the right candidates. Communicating what you are looking for and what you can offer them should they decide to join you should be clearly stated and be upfront. Christy has been promoted based on her amazing HR skills! Just wanted to reach out and let you know about an article. I just published. “Why Employers Prefer Targeted Job Applications”. I think even though both the topic are similar in nature the content published is unique gives our readers a very good insight on the topic. What I love most about your article is the illustration showing what job seekers are looking for in a job description. What is the data source? Nice article and so kind of this site to provide a job description template. Well done! Writing job descriptions can be painful and tedious but without one you really don’t have starting point. Done the right way though, it can make the rest of the your process run a lot smoother. So I always recommend using a unique job description for each and every role. Personally, I like to DirectReports.com. It’s free and saves a lot of time. I highly recommend to anyone hiring these days. Directreports.com sounds like a good resource. I’ll have to check them out. 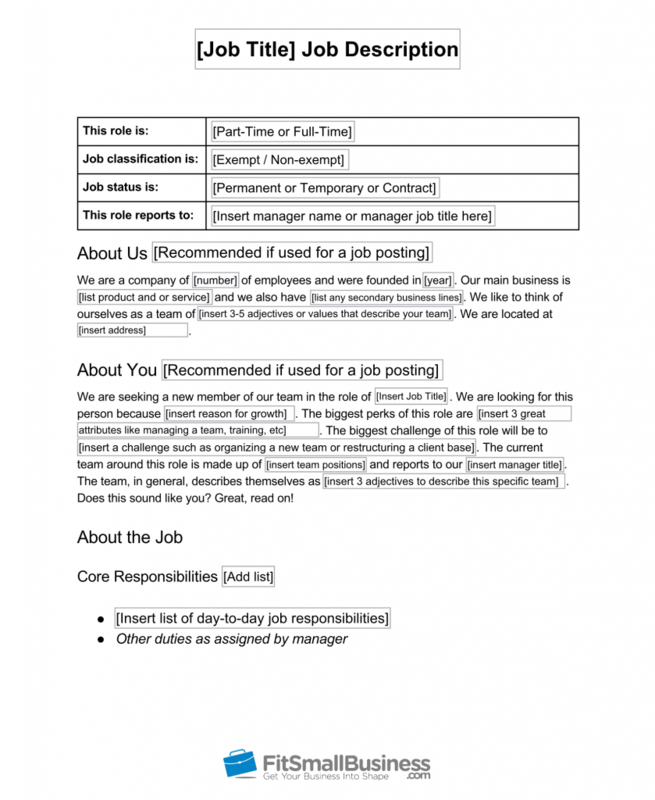 Our job description template serves as a fill-in-the-blank document that you can give to hiring managers to help specify the job duties and requirements.